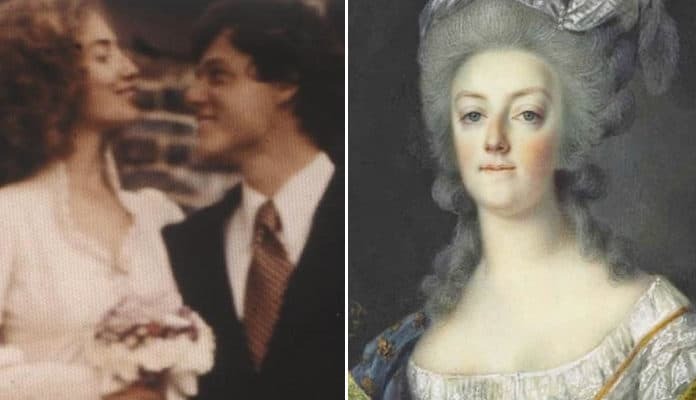 In the murky world of modern politics and the rising role of women in high offices, Marie Antoinette’s position might bear a striking resemblance to a modern politician: Hillary Clinton. Comparing the public females reveals that the two actually have much in common, and also the reality that women in politics face many of the same challenges today as they did in the 18th century. Marie Antoinette was pledged to be married to Louis XVI when she was only ten years old and didn’t have much say in the matter. However, the young princess wasn’t too keen on the idea of getting married, which meant leaving her family and home country of Austria and exposing the rest of her life to a gaping public. How much of her life would be revealed to the world? Well, for starters, the wedding ceremony ended with a going-to-bed ritual. She was led to bed with her new husband when they were expected to consummate the marriage. A curtain was drawn around the bed, but on the other side of the curtain were members of the royal family. Likewise, Hillary Clinton wasn’t too thrilled about the idea of getting married, even though Bill had proposed multiple times. She was already building up a promising career in Washington, D.C., and didn’t want for her achievements to be in the shadow of a husband. However, when the future Secretary of State passed the Arkansas bar exam but failed the D.C. one, Hillary agreed to marry Bill and move to Arkansas. Even then, she was concerned about what the prospect of marriage would mean for her political career.